Is there anyway I could create a new partition without formatting my computer? I have Windows XP Home SP2. Right now I have 72.4 GB's so I would like to keep 62.4 GB's, and make a new partition with 10. I'm not sure if the whole drive has been formatted but it doesn't look like it. I'll attach a screenshot because I'm not sure. I am sure i have read that you can change partition sizes in the Disk Management area, but I have to admit I have never tried it with partitions that have had data in it because it has been on customers machines. 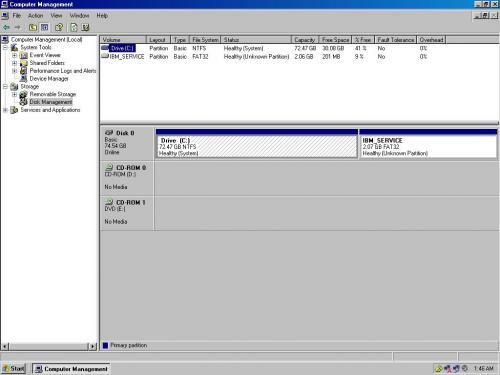 I am not sure if anyone else here can confirm if you can change partition sizes in Windows XP with no loss of data. Alright, I was planning on formatting this computer anyways. It came pre-loaded with the XP Home disk so I'm going to have to buy a new one (buying XP Professional this time). When I put this in right at the startup, how do I create a partition right away so that I can also use 10 GIGs for trying out Suse (linux os)? Thank you for your help. I downloaded the program Partition Magic 8.0 - Demonstration Version. I selected "Create a new partition" and followed the steps. Afterwards, it says "4 Operations Pending," and when I click apply, it says something about buying the full version. Can I not create a partition through this program w/o buying the full one?